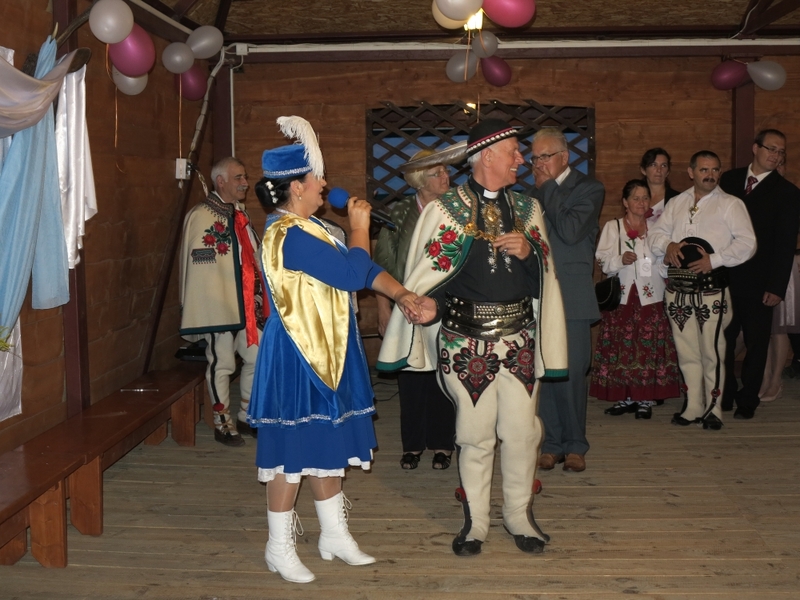 From 18.8. till 21.08.2016 in Myczkowce, in the most south-eastern corner of Poland, the 22nd National Meeting of the Couples Who Had Non-Alcoholic Wedding took place. The annual event, called "Wedding of the Weddings", gathered this time about 50 couples with their children from all over Poland. There were also guests from the Ukraine. The program included a concert of African Evangelisation Band, a ship cruise through the artificial Solina lake, visit in a biblical garden, in an open air museum of church miniatures, and the traditional non-alcoholic wedding party. But the participants come here for mainly because of the retreat, which is an integral part of annual meetings. The preachers were the Bishop of Rzeszów Jan Wątroba, auxiliary bishop of Łomża Tadeusz Bronakowski, Father Władysław Zązel (who inizierte the meeting series). Lectures were given by Prof. Zofia Włodarczyk from Agricultural University of Kraków (Cracow) and a number of other speakers. The topics of the lectures included biblical gardens and their importance in the proclaiming of biblical content, spiritual dangers in the modern world for individuals, marriages and families and on the family as the first school love, as well as on the fight against sobriety in the communist era and attempts to restore the pre-war sober lifestyle nowadays. Daily all took part in Holy Mass and Divine Mercy Chaplet. On Friday there was a Stations of the Cross devotion outdoors. The aim of the event is to spread the idea of nonalcoholic weddings, to promote alcohol-free lifestyle, to show their own children, that you are able to spend leisure time without alcohol and that the gaiety needs no chemical stimulus, but on the contrary it streams from the unburdened human heart. This puts the religious education at the center. Man is happy when his conscience is not burdened by sin. Therefore confession and repentance is an important point of the meeting. It is further noted that the love of one's neighbor, compassion towards others who are affected by the load of alcoholism, whose exclusion is abolished from society by carrying alcoholic events like weddings offering them the opportunity to participate free of risk in social life, Loving parents should never let the children see them in a drunken state. The simplest way to achieve this goal is via the abstinence of parents. Further, abstinence is the surest way to exclude the FAS syndrome in children. The message of the event is directed primarily to the Polish society, but there were participants in the past from other European countries like France, Germany, Austria, Slovakia, Belarus, and this year also from Ukraine. Only 20-25% of weddings in Poland are alcohol-free. Is it much or little? The main thing is that the betrothed are moved by the deep Catholic faith to organise such a wedding. By contrast, the alcoholic weddings are increasingly becoming the symptom of faith decay, especially if you look at vulgar songs, amoral games and sometimes even adultery present at alcoholic events. Briefly, alcoholic weddings undermine the religious ceremony of the wedding and the Catholic marriage itself. Therefore, the struggle for nonalcoholic weddings is not just a concern for the physical health, but also the struggle for preservation of the Catholic faith, against its expiration in the family. See a slideshow of Thursday, Friday, Saturday, Saturday night and Sunday of this year Wedding of the Weddings celebrations. While recalling the event, we shall not forget our host, Father Bogdan Janik. The Retreat and Rehabilitation Center he created and where he hosted us is an expression of a deep love of him for poor children and for the poor inhabitants of this region. He is himself an abstinent from alcohol and works to spread such a life style. But he understands well that in order to refrain from drinking alcohol one needs to have hope. So like Father BronisławMarkiewicz did a century ago, he creates signs of hope for the poor inhabitants. The Retreat and Rehabilitation Center by itself as a job generator for local workers. Gardeners, carpenters and other find a job here. The mini-zoo, church miniature museum, the biblical garden attract tourists from various parts of Poland so that the local people can make life of tourism. He helped them to create hiking trails in the neigbouring Bieszczady mountains so that they can keep the visitors for even longer and attract more of them. So thank you Father Janik for hosting the Wedding of the Weddings and for the excellent personal example. We thank also the Family Mazur who organised this event in an excellent and fruitful way.